What do Jody Watley, Terence Trent D'Arby, Cutting Crew, Breakfast Club and Swing Out Sister have in common? Besides all releasing awesome singles in 1986-87, they were the five acts nominated for Best New Artist at the 1988 Grammy Awards. Only one of them could be the winner and she arrived on the ARIA top 50 this week with her breakthrough single. Was it the start of a successful solo career for the former Shalamar singer? Not so much in Australia, it would turn out. Despite a string of US hits, this would be her only local look-in. Dave Dobbyn wasn't giving anyone else a look-in at the top of the chart 30 years ago this week. 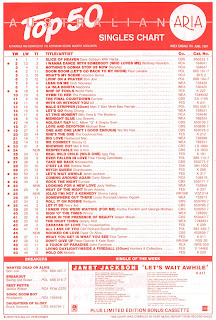 "Slice Of Heaven" held off even a bulleting Whitney Houston to spent a third week at number 1. It would hit the top 40 upon re-release in 1988, but for the time being the debut single by the American soul/R&B singer (and Grammy nominee) fell a long way short of its UK top 10 status. Also failing with their debut single is a band that'd have to wait three years to cross over in Australia. "True" was taken from Concrete Blonde's self-titled first album. We saw lead singer Ben Very-Unpronounceable-Name (as Smash Hits used to call him) as part of Ferry Aid last week, but unfortunately there was no love for his band's excellent UK top 3 hit. The title track of his seventh album wouldn't be the song to break the chart flop curse for Gary Moore, but his top 50 breakthrough would come with his next release. It has a synth-y sound I should like but I never did take to this one and only Australian hit for New Zealander Shona Laing, who has enjoyed much more success in her native country. In fact, as I pointed out in the (second part of) the very first blog post I wrote, I kind of hated "(Glad I'm) Not A Kennedy". From its unnecessary brackets to its odd premise to its overly wordy verses, it just did not appeal to me at all. It obviously floated enough other people's boats for it to reach the Australian and NZ top 10s. Given its subject matter, it even picked up some attention in the US. Despite releasing funk/soul classics like "I Can Make You Feel Good", "A Night To Remember" and "The Second Time Around" in the late '70s and early '80s, Shalamar had never been that big a deal in Australia. They only reached the top 50 here once, with debut single "Uptown Festival" - and only because that was a medley of well-known songs like "I Can't Help Myself (Sugar Pie, Honey Bunch)" and "Stop! In The Name Of Love". Soul Train dancer Jody Watley was hired to join Shalamar following that single, which had been recorded by session singers, and stayed with them until 1983 when she embarked on a solo career. But except for randomly appearing as part of Band Aid, she didn't have any luck and her first two singles disappeared without a trace. That all changed in 1987 with the release of her debut, self-titled album on MCA Records, which featured a duet with George Michael, a brilliant single co-written by one of Madonna's main collaborators and, of course, "Looking For A New Love", which coined the phrase "hasta la vista, baby". With its feisty attitude and edgy funk/R&B production, the track was in the same vein as Janet Jackson's recent Control singles but more than stood on its own merits. 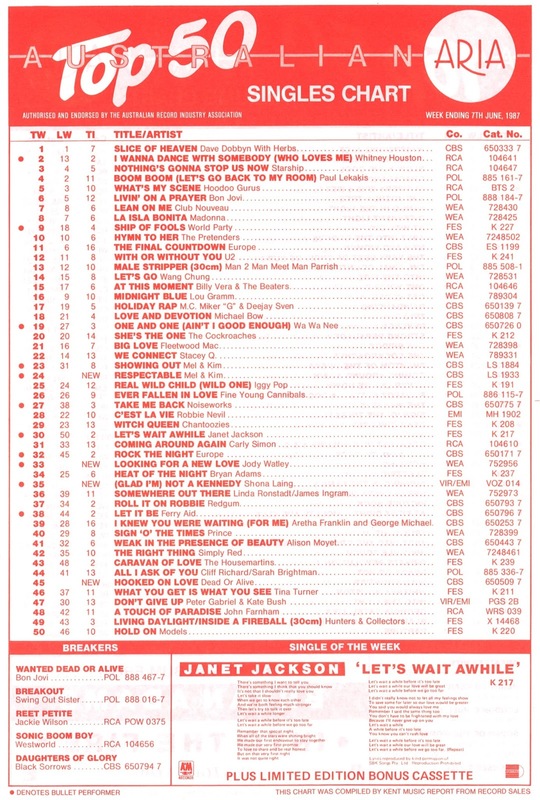 Spending four weeks at number 2 in the US and just missing the ARIA top 10, the song signalled the arrival of a new star, but despite following it up over the next few years with quality singles like "Some Kind Of Lover", "Real Love" and "Friends", Australia took little further notice. Speaking of feisty attitude, Londoners Mel & Kim displayed their cheeky charm on not one but two high-flying hits this week in 1987. Their debut single, "Showing Out (Get Fresh At The Weekend)", leapt up into the top half of the chart and, one place below, follow-up "Respectable" blasted into the top 100 at number 24. The latter clearly spurred on the earlier release, with many people no doubt picking up both tracks by the Appleby sisters at once. Although "Showing Out..." would go on to enjoy a lengthy stay in the top 20, "Respectable" became far and away the bigger hit, going all the way to number 1. With their simple to copy dance moves, stylish outfits (berets were so on trend) and one of Stock Aitken Waterman's best ever songs, the duo were the perfect pop package, but their personalities kept them from feeling manufactured, unlike some of the Hit Factory's later acts. Brilliant in every way, "Respectable" remains one of the best pop moments of all time. Next week: a massive hit by Madonna's former group (and another 1988 Best New Talent Grammy nominee), a re-release of a two decades-old song (by Jody Watley's godfather), two long-forgotten bands whose songs I quite liked and a power ballad hit by Australia's new favourite rock band. If pop music was evolution, Terence Trent D'Arby looks like the interim stage between Prince and Milli Vanilli. I remember 'If You Let Me Stay' from the album's TV ad, but don't think I ever heard it in full. The Gary Moore track, which I didn't know previously, is not bad. The music video for 'Hooked On Love' is just a collage of clips, as embedded. I didn't know the song until catching it on a Countdown repeat in 2005, but it's one of my faves of theirs. I liked '(Glad I'm) Not a Kennedy'. After not hearing it since probably 1987, it was one of the first mp3's I downloaded... and was slightly shocked at how 'cheap' the production sounded, compared to my memory of it. Decent song, just needs better production (and they use the same footage for "like a loaded gun-gun-gun..." 3 times in the video, which also looks cheap). 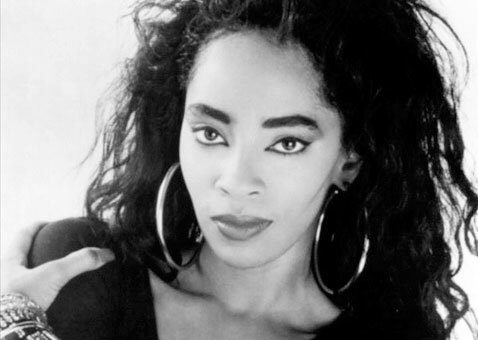 It's a shame Jody Watley didn't have more success in Australia. Several later-released singles of hers were much better than 'Looking For a New Love' too, I thought. I remember actually thinking Mel & Kim were bald when I first saw the 'Respectable' video. I also thought they were twins.